Bankruptcy asset sales of used food equipment. Make your bid! Buy the best used equipment for the food industry on Industrial Discount! We are an international auctioneer specialized in the sale of industrial machinery and equipment belonging to bankruptcy procedures; this results in a price much lower than what can be obtained for the sale in the normal market. Moreover, online auctions are time and cost-saving: you aren't required to travel to reach the auction spot, as you can bid directly online and, if you wish, you can activate the Proxy Bid, our automatic raising system which relaunches your bids on your behalf, accordingly to the maximum price you set. To choose the best used food processing equipment, each item is supplied with a full description, technical specification each item is equipped with, high-quality pictures and much more! Attending our online auctions is extremely easy: register for free, activate your account and submit your offer. If it will be the highest, you will win the auction! Our catalogue of online auctions is constantly updated: every day you will find used food equipment for sale at the best price. Don't miss the chance, bid online now! 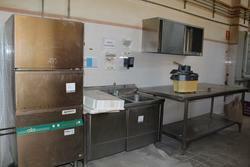 Do you want to stay updated about the used food equipment for sale on our website? Subscribe to our newsletter! You will receive a weekly email showing new items for sale.